Come along to the monthly meeting of the Society and hear readings from Henry Lawson’s poetry and prose and the works of other like minded poets from the past and present. Visitors are welcome! Monastery Hall, rear of St. Francis Church, 326 Londsale Street, Melbourne. Please enter via the St Francis car park in Elizabeth St, and enter through the back door of Monastery Hall. $5.00 and includes afternoon tea. Once a year in February, we gather together in celebration of Henry’s life with renditions of his works, performances of singers and other poets and prose making it a thoroughly engaging afternoon. 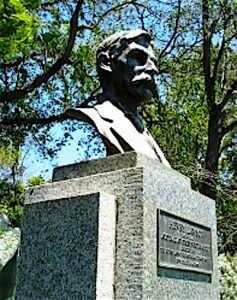 Members originally congregated around the statue erected in Henry’s honour in 1960 in Footscray Park, but due to the uneven terrain we now gather at the Gazebo to the extreme right of Henry’s statue location from the Ballarat Road entrance. 1st Sunday in February, 1:30-4.00pm. The Bryan Kelleher Memorial Picnic Day is conducted jointly with the Australian Natives’ Association at the historic Box Cottage in Ormond. As well as reading and reciting of the works of Henry Lawson and others, there is a tour of the cottage during the afternoon.